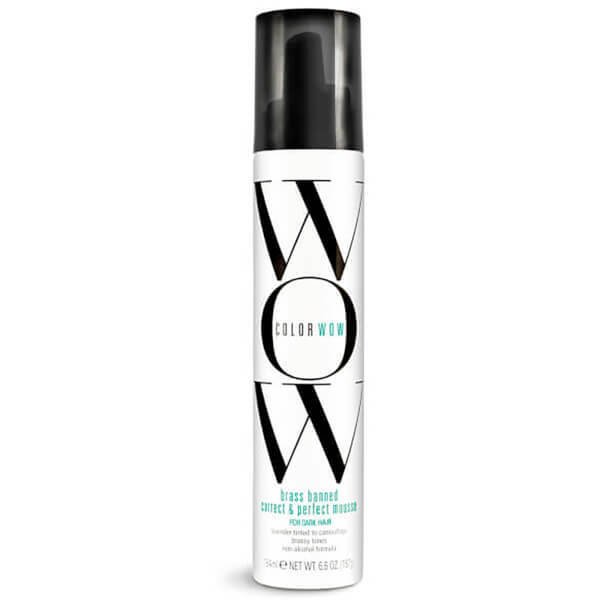 Catering specifically for dark hair, the Brass Banned Correct and Perfect Mousse from Color WOW works to counteract orange, red and brassy tones. Fortified with innovative polymers, the teal tinted formula gives hair colour richness and depth, whilst adding body and making styling much easier. Expect radiant, healthy-looking locks with excellent colour vibrancy. Shake well. Hold upside down and dispense into palm. Apply evenly to damp hair and style as usual. Water (Aqua), VP/VA Copolymer, Isobutane, Propane, Cocamidopropyl Betaine, PEG-40 Hydrogenated Castor Oil, Diazolidinyl Urea, Methyl Hydrogenated Rosinate, Benzalkonium Chloride, Fragrance (Parfum), Panthenol, PPG-5-Ceteth-20, Myristamidopropyl PG-Dimonium Chloride Phosphate, Amodimethicone, Iodopropynyl Butylcarbamate, Trideceth-12, Cetrimonium Chloride, Linalool, CI 42090 (FD&C Blue 1), CI 61570 (D&C Green 5).